Work of the Poet: Happy Hanukkah! Hanukkah (Hebrew: חנוכה‎, IPA: ['χanuka], alt. Chanukah), also known as the Festival of Lights, is an eight-day Jewish holiday commemorating the rededication of the Second Temple in Jerusalem at the time of the Maccabean Revolt of the 2nd century BCE. 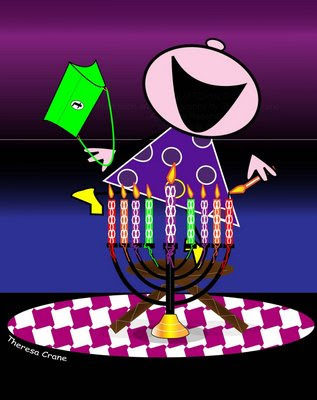 Hanukkah is observed for eight nights, starting on the 25th day of Kislev according to the Hebrew calendar, and may occur from late November to late December on the Gregorian calendar. The festival is observed by the kindling of the lights of a special candelabrum, the Menorah or Hanukiah, one light on each night of the holiday, progressing to eight on the final night. An extra light called a shamash (Hebrew: "guard" or "servant") is also lit each night, and is given a distinct location, usually higher or lower than the others. The purpose of the extra light is to adhere to the prohibition, specified in the Talmud (Tracate Shabbat 21b–23a), against using the Hanukkah lights for anything other than publicizing and meditating on the Hanukkah story. (The shamash is used to light the other lights.) As such, if one were to read from the lights–something prohibited–then it's not clear whether the light one's reading from was from the Hanukkah lights or the shamash light. So the shamash acts as a safeguard from accidental transgression. 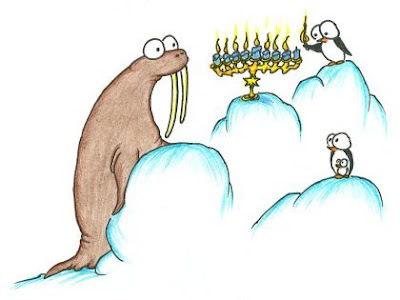 HAPPY HANUKKAH TO ALL MY BLOGGER FRIENDS WHO ARE CELEBRATING! I've been over at Robin's. A frequent participant of Ruby Tuesday. She has this wonderful and deep explanations of Jewish traditions and celebrations. Yours were fine too, of course. I join in wishing all a happy Hanukkah. Thank you, Mary. I like your little halacha explanation of the shamash. Well said! Enjoy your holidays. I'm enjoying mine. I join !!! wishing all a hppy Hanukkah ! Mary, thanks for all these informations. Always interesting to better know others.